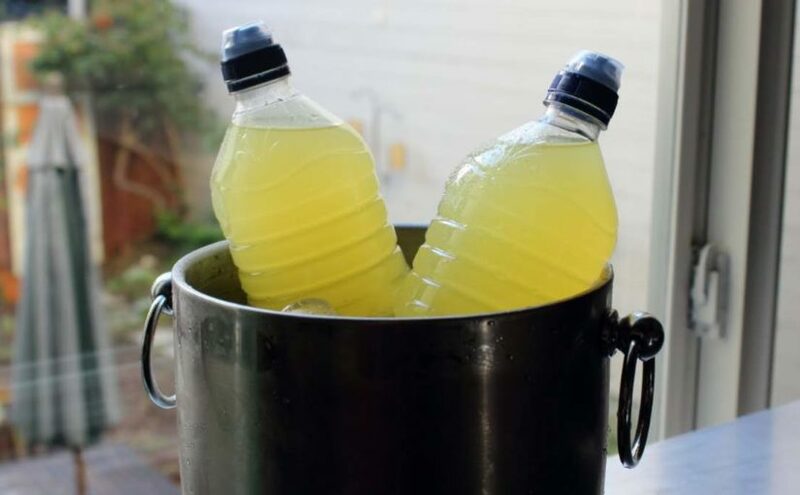 You can easily prepare your own homemade isotonic drink. Prepare a cup of green tea (or another herbal tea, what taste you prefer). Dissolve 30-40 grams of sugar into it. Add a pinch of salt. Complete it to a liter with water. Cool it down in the refrigerator and drink within 24 hours. You can replace tea+sugar with 50 cl of fruit juice and complete to a liter with water. Prepare a cup of green tea (or another herbal tea, what taste you prefer). 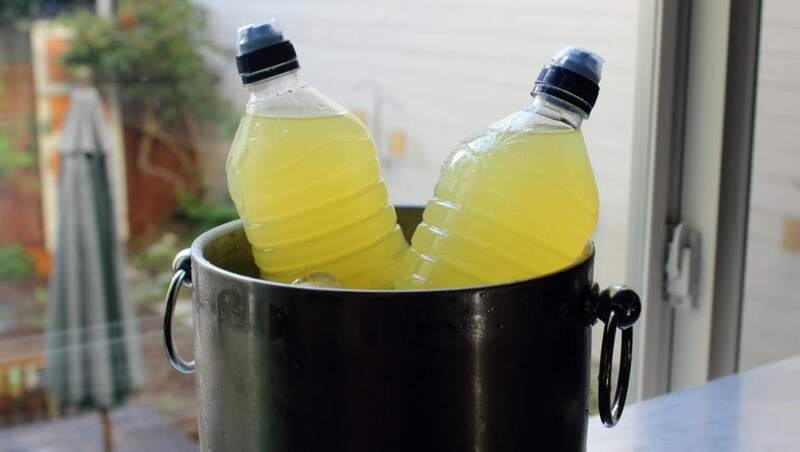 Dissolve 30-40 grams of sugar and 30-40 grams of maltodextrin(1) into it. Add a pinch of salt. Complete it to a liter with water. Cool it down in the refrigerator and drink within 24 hours. You can also replace tea+sugar with 50 cl of fruit juice and complete to a liter with water. If you use fresh fruit juice, filter it. Otherwise, it will be hard to drink from your bicycle bottle. The golden rule: drink before feeling thirsty, (and also eat before feeling hungry), absorbing small sips on a regular basis. If you feel thirsty during an exercise or a race, it would be too late to drink: the sensation of thirst indicates a significant loss of water which will be difficult to recover. Do not ingest too large quantities at a time as this would slow down the stomach activity which is limited to approximately 750 ml per hour. Every one percent of body weight lost in water implies a decrease of 10% of the physical abilities! That’s why it is essential to hydrate properly before, during and after the effort. Maltodextrin is an oligosaccharide that is used as a food additive. 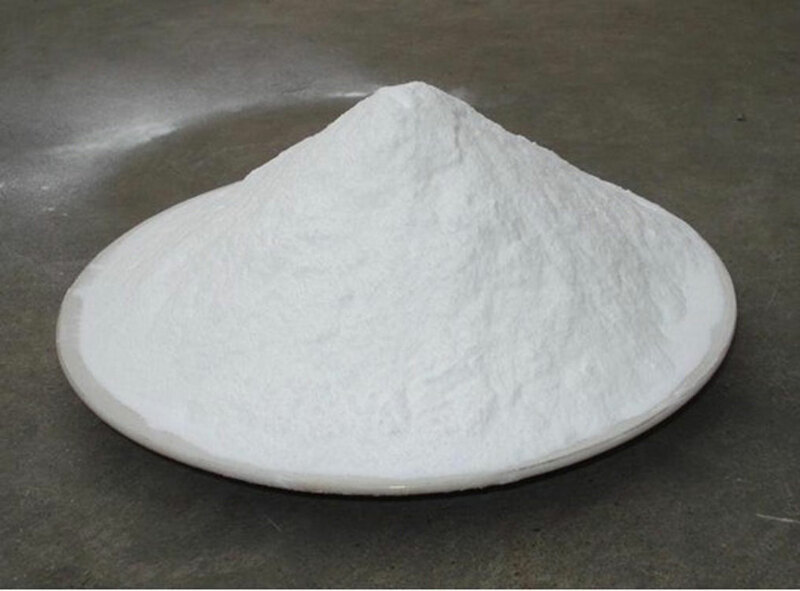 It is produced from starch by partial hydrolysis and is usually found as a white hygroscopic spraydried powder. Maltodextrin is easily digestible, being absorbed as rapidly as glucose, and might be either moderately sweet or almost flavorless. You can find maltodextrins in specialized shops or on the Internet.